In theory, it’s a good idea. House Minority Leader Nancy Pelosi wanted to get together with her colleagues–namely the other Democrat women in the House of Representatives–and commemorate the record 61 seats they hold in the House. But there are a few small problems with that. Namely, it’s cold, the picture is outside, and not everyone showed up for the picture. 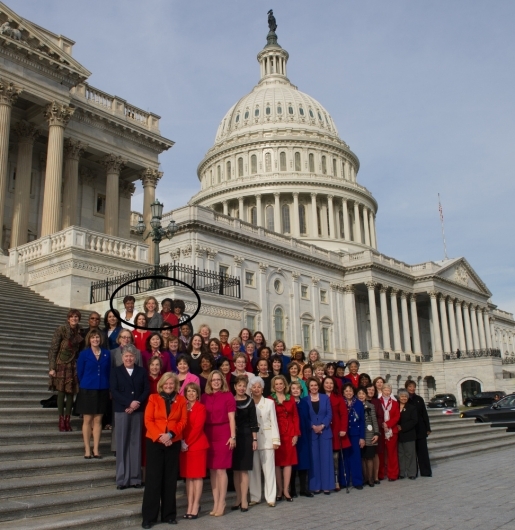 Four Representatives, including Democratic National Committee Chair Debbie Wasserman Schultz, failed to make it on time for the picture, so Nancy Pelosi had the tardy women added to the picture via Photoshop. So, the response to criticism about using photo editing tools to mess around with official photographs is to defend the accuracy of the altered photo versus the actual original photograph. Rather than just adding the four names as not pictured, you just do a hackjob and drag them into the picture as a fake back row. Right then. I guess Congress has a different definition of accurate historical records than the rest of us.